What a great picture! 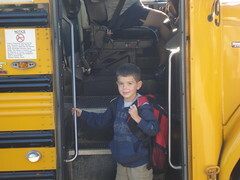 The first day of the school bus will be such a memory! Thank you for the blog! The mean mom reminded me of a sculpture in Meijer Gardens, MI. It is a huge peice of granite, hands on hips, lips pursed and squinting eyes. It appears as a comic book character - very funny, very expressive - very recognizable by kids of all ages!